When you are attending an interview for any company, always remember your conduct and behavior always matters. You might have the grades, the excellent SAT scores and great work experience but if you don’t know basic manners, then none of this counts. You are going to lose from landing the job of your dreams if you aren’t aware of your behavior. And that is what exactly matters during HR interviews. Here you will be asked questions that will determine your level of commitment, how determined and focused you are etc. To learn more about HR interviews and how to prepare you the right way, keep reading the post. You are definitely going to be helped. What is an HR Interview Like? HR Interviews, also popularly known as Human Resource Interview, is basically designed to see how you conduct yourself and handle your behavior in front of others. Your strengths and weaknesses will be noticed here and the whole purpose is to check through your background and know whether you are perfect for the job offer or not. 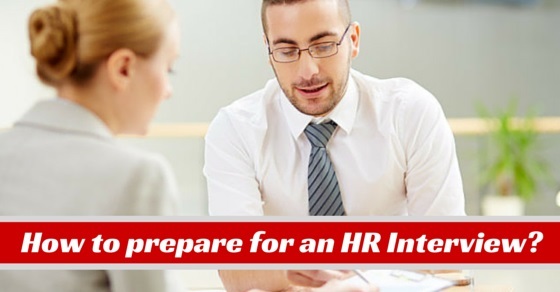 This is why it is extremely important to be well prepared for HR interviews. It will always help you know whether you can make it to the next few rounds or not. So brace up and be ready! No matter which job interview you are about to attend, you will be asked to say something about yourself. If it is an HR interview, the chances double. Here you should always remember the recruiting manager or the person handling the interview is not in the least interested in your personal life. You don’t have to jot down everything you have dealt with in every situation of life. Your job is to give your work history in short. Make sure to focus on those parts that keep you going at this moment. Try to show that you are very much suitable for the position he or she is looking to fill. Speak about where you received education from and how you have worked hard to reach your goals. There are possibilities you will be asked about both your strengths and weaknesses. So make sure to emphasize on the strengths at first. Speak about them in detail but do not try to come across as too confident. Someone who is too egoistical or arrogant is not in the least appreciated during an interview. Nobody wants to work with people who have an attitude. So try to come across as someone who is more cordial and understanding. When you speak about your weaknesses, try to mention how hard you are working at the moment in order to improve this. You can admit the truth but don’t forget to mention that you aren’t a perfect person like any other individual and that you are willing to make the right changes. When you are sitting for an interview, you will be asked about the company. Speak to the HR manager and discuss with them the reason behind your application. Talk about what keeps you interested towards them. If you have a couple of questions related to the company, do not worry about asking them. But before you attend one, make sure you have some idea about the mission of the company as well as its goals. Also try to explain to the interviewer why you are perfect for the job post they are trying to fill. You should be able to speak about all experiences that are related to the job. Also try to compare the previous job opportunities you’ve had and the number of duties you’ve had. During interviews, you should always be ready to deal with questions that are related to work pressure. So make sure you have prepared some questions already. The interviewer can also ask you questions like “How would you react if you were in a situation like this?” During situations like this, you should be able to relate to the past and explain in brief how you have tacked these situations. If there was a sign of progress, don’t miss out on that either. What the manager is trying to do is that he wants to know how you are in person and how you can deal with difficult times. Talking about your working style with your HR manager is extremely important. You should say how versatile and capable you are by nature and that you can adjust in almost any environment. 7. So why should a company hire you? Do you think you have what it takes to get into your dream company? If yes, then be ready to answer it. This will definitely be thrown at you during an interview. Make sure you are answering this question in a proper and appropriate manner. Speak about your talents and explain how ideal you are. When you show off your smart and dedicated personality, you automatically make a better impression about yourself. Always remember to prepare a whole lot of resumes, cover letters and references beforehand. They always help during interviews. Depending on the position that you already belong to, you will be expected to be a level higher in terms of behavior and conduct. Therefore, it is always better to keep all the documents ready from beforehand. This will also give you a better idea on what kind of information is important to get you selected. 9. What should you do on the day of the interview? On the day of the interview, make sure you are dressed properly. Good dressing always matter. It makes the first impression. You cannot leave that out. If you like wearing branded, do that too. But don’t try to overdress yourself. As far as you are comfortable, that is all that really matters during interviews. Also do not make the mistake of pretending to be someone you are not. Because ultimately you will get caught and that will stop you from getting the job! In order to nail the interview like a professional, you need to keep a few things in mind. First of all, when your name is called out for the interview, make sure you are calm and composed. Don’t get over excited or hyperventilated. Second, make it a point to carefully listen to all the questions that are asked before you answer them. Keep your ears wide open. Finally, If you feel like you cannot answer a particular question, don’t worry! Just ask them again in order to get a clarification. Please remember that when you are answering questions, make sure you are being honest throughout. There is no reason to show off or lie. That never works. Also, interviewers appreciate honesty. Don’t be too arrogant either. Try to be as humble as possible. Instead, you should lay emphasis on how you can help the company reach its goals. Say that you are smart when it comes to work and that it is your first priority. Lastly, please do not brag at any cost. It won’t take long for anybody to notice. Show more energy and confidence. Lastly, always remember to show your ambitious side during HR interviews. Big jobs always go to those people who show how talented and capable these people are. So try to show to your interviewer that you are an ambitious person by nature and you like to stay motivated always. Make sure all answers to your questions are short and crisp. There is no reason to elongate everything. Stick to the point and you will definitely help the interviewers understand how talented and efficient you are at work. Making a fine impression during an HR interview isnt all that difficult! However, you have to prepare yourself if you’d like to nail the job. The tips and ideas should definitely help you in the process and hopefully you will create a very good impression during all your interviews. Just make sure you have rehearsed once before you finally attend one. Don’t memorize your answers whatsoever. That job is definitely going to become yours if you follow them. On that note, good luck.